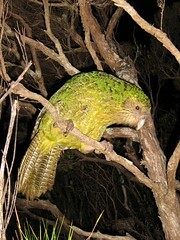 Hoki, a female kākāpō on Whenua Hou. One of the giants of New Zealand conservation, Don Merton, passed away this week. Don was instrumental in saving from extinction the South Island saddleback (Philesturnus carunculatus carunculatus), the black robin (Petroica traversi), and the kākāpō (Strigops habroptilus), surmounting often considerable obstacles. There are very few conservationists worldwide with such an impressive legacy. Some of us had the pleasure of hearing Don's keynote address at the 2005 Australasian Ornithological Conference in Blenheim. He talked at length on his career to date and the challenges ahead. He started his address by relating a story from his childhood. As a prank when a boy, together with his brother, Don stole a goldfinch nest with eggs and had his Grandmother's male canary incubate the eggs and raise the young. Don attributed this childhood experience with cross-fostering as the gem of his idea later in life to cross-foster black robins with grey warblers (on same island, unsuccessfully) then tomtits (only present on a different island but successfully). This ingenious stunt famously saved the black robin. Don's career had its bittersweet moments. When ship rats reached Big South Cape Island, Don and colleagues from the Wildlife Service mounted a rescue operation, despite a lack of support from some in Wellington. (It is hard to comprehend in hindsight but at that time there was widespread skepticism amongst ecologists internationally that predators could drive prey to extinction in large areas.) All South Island saddleback now descend from the birds Don and colleagues saved from Big South Cape Island in 1964. However, the six Stead's bush wrens they rescued failed to survive and that was the last of the species, as it was for the Stewart Island snipe and the greater short-tailed bat. Don looked back with regret that his team were not allowed to take all the kākāpō they found from Fiordland because of the risks of mortality during translocation. All of the Fiordland birds they left died, lost to mammalian predators. He revisited Fiordland several times in the hope of finding more birds, without success. Richard Henry, the famous Fiordland bird rescued by Don and his team, passed away in December last year, around 80 years old, after passing his genes into the surviving kākāpō. All other kākāpō genes are now from Stewart Island Birds. Don and the plight of the kākāpō featured prominently in Douglas Adams and Mark Carwardine's book, "Last Chance to See..." (1990). They recount visiting the last kākāpō track and bowl systems in Fiordland, still there but no longer visited by kākāpō. Don kept a potato in the bowl they visited, hoping that one more bird would visit and tidy it up. When they left the site, Don carefully put the potato back on the edge of the bowl. No kākāpō returned. Mark ended their book as follows. "There is one last reason for caring, and I believe that no other is necessary. It is certainly the reason why so many people have devoted their lives to protecting the likes of rhinos, parakeets, kakapos and dolphins. And it is simply this: the world would be a poorer, darker, lonelier place without them." Thanks, Don, for leaving us a world less lonely.